Whether your project is big or small, simple or complex you will still need to monitor it. Of course your first challenge will have been to plan it and to set up the project controls. Then you will have had to keep these controls updated with current information. That all sounds quite daunting but Planner is your perfect companion for this. As well as Planner doing all this it also includes Project Analysis capabilities for free. Planner provides you with a tool for preparing your project plan. Unlike MS project it gives you just the core planning features used on the majority of projects. Your tasks can be scheduled and grouped into summaries, they can also have predecessors. You can also use the cost model if you want to set fixed and resource costs for tasks. You can use Planner to collect your risk, issue and change data as well. Having all of this to hand in one file makes your task easier when it comes to updating these. Many users keep the data collection quite simple, just showing % complete or notes and status changes for risks and issues. Some users go a lot further with their monitoring. These users will often also collect actual costs and manage formal responses to risks, issues and changes. Planner provides you with the ability to do as much or as little as you like here. 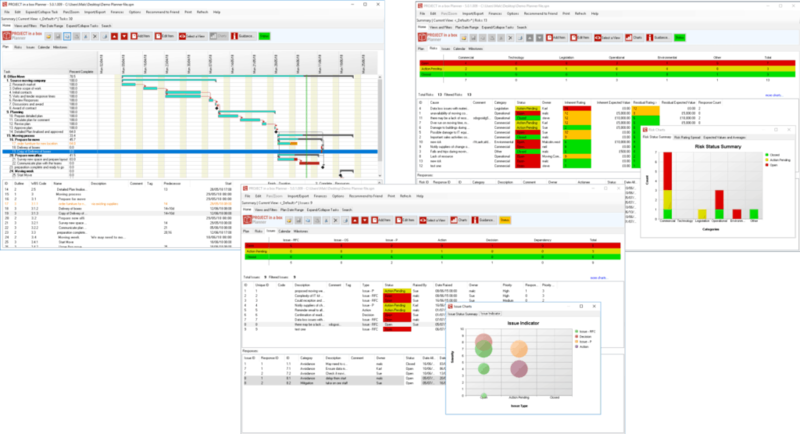 We don’t just provide Planner to collect the data, we also include a great project analysis capability within it too. You can use ‘views’ to get project analysis results quickly and consistently. You can either use the pre-saved views for common analysis or create your own custom ones. Your choice of view determines the data you see in the analysis and also how it is shown. The filters within your chosen view are powerful and allow compounding of rules. So you can look easily for things like overdue tasks or unresourced activities within your plan. You can use the same approaches on your risk and issue registers. Here people often look for top five not closed risks or any open issues not recently updated. When you can do these sort of project analysis quickly it can save you lots of time and also save you from nasty surprises! Planner which includes all this is free. Just sign up here to download it and get started. We have also prepared a video covering how this all works. You can see it on YouTube here, or here on this site.